To do full justice to its rarity, Alexandra Rosé Millésimé could not be released in anything but a majestically refined bottle. Its singular form is worthy of the great master glassblowers of the 17th century. The unique line of its shoulders, the elegance of its long swan’s neck recreate the hand-blown bottles that contained the very first sparkling champagnes drunk at the French court. The label is decorated with powdered gold. For this latest vintage, Alexandra Rosé Millésimé goes back to its origins, being inspired by the prettily rounded label of the original 1982 cuvée. The elegantly symmetrical semi-circular curves are accentuated by the choice of unobtrusive lettering. The gilded scrolls have been replaced by a fine, coppery edging. 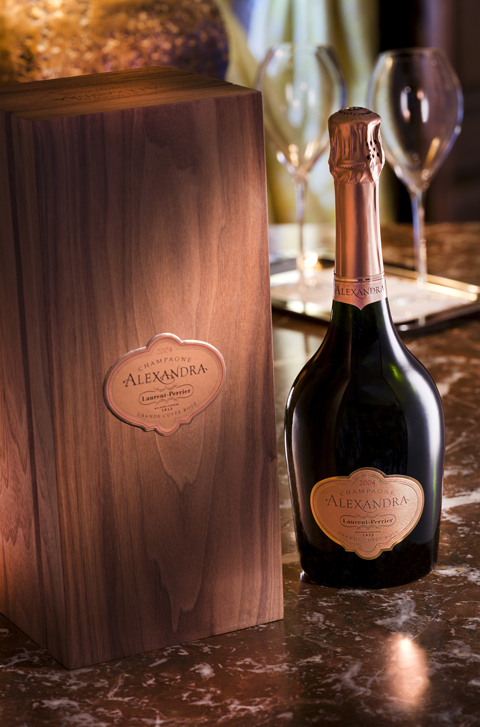 The bottle nestles in a new wooden box that enhances and shows this great cuvée off to perfection, reminding us that this is one of the great wines of Champagne, simultaneously a precious object and a delight to touch that is masculine, refined, and elegantly understated, in the image of the singular personality of Alexandra Rosé Millésimé. And for the first time in his history, this exceptional wine is also being released in magnum format – the ultimate temptation.